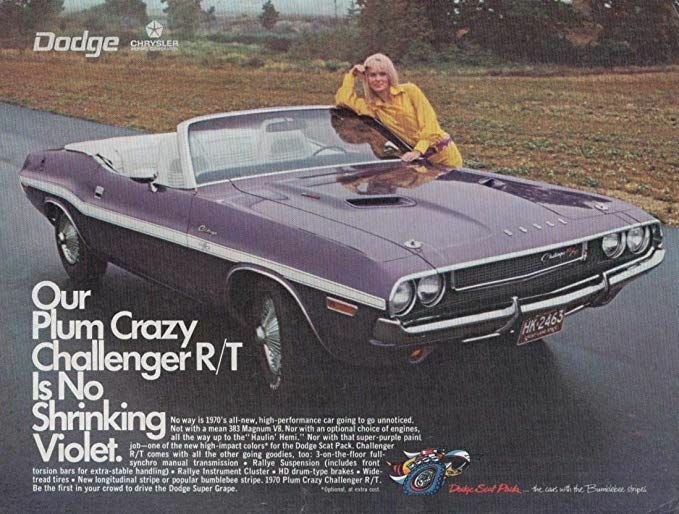 With an attention-grabbing and factory-correct Plum Crazy Purple color combo, this restored 1970 Dodge Challenger R/T SE is already exceptionally appealing. When you see that this real-deal R/T comes with everything, from a 440 six-pack to a stick shift, you'll realize this is one irresistible Mopar. This coupe is out to get all the right attention. The menacing 440 six pack, 4 speed, and limited slip rear end, all make this one incredibly fun drivetrain, that reminds motorists what the "muscle car" era was all about. The car underwent a restoration over the course of 30 months in 2010 that included a repaint, engine rebuild, suspension rebuild, and reupholstered interior. Only 1,708 miles since rotisserie restoration! The 5-digit odometer was reset at the time of the restoration. Conceived as a styling and convenience group, exterior cosmetic features of the SE included a vinyl roof incorporating a smaller rear window opening with external bright moldings and the three-pointed Dodge "fratzog" emblem positioned on each C-pillar. The interior is equipped with high back black leather (HRX9) buckets with a color-keyed dashboard, carpets, and wood trim along the Rallye instrument cluster, center console, and pistol grip shifter. Interior features unique to the SE models include identifying script along the door panels and an overhead console with warning lights for low fuel, door ajar and unfastened seat belts. The factory radio is retained, and a modern stereo unit has been installed in the glovebox.